Vada Somerville was the first African American female dentist educated at the University of Southern California School of dentistry, and the second African American graduate in the university’s history. Graduating in 1918, Somerville was the only African American student in her class of eighty-eight graduates. Somerville was born Vada Watson in Pomona, California on November 1, 1885, one of seven children. Her mother, Dorothy Watson McDonald, instilled a strong work ethic in all of her children, encouraging them to be successful. One of Watson’s brothers graduated from the University of Southern California Law School, and had a career in the Los Angeles City prosecuting attorney’s office. Another brother was the first black policeman in Los Angeles. With the help of a Los Angeles Times scholarship, Watson graduated from the University of Southern California as a liberal arts major. 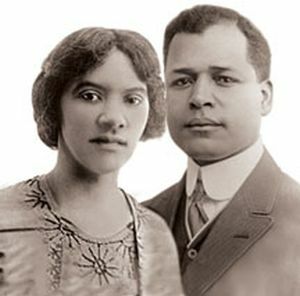 In 1912 she married Jamaican -born John Somerville, who was already practicing dentistry after becoming the first black graduate of the University of Southern California’s dentistry school in 1907. Initially, Somerville began working as an office secretary for her husband’s practice. In the wake of World War I, with the fear that her husband might be drafted, Somerville decided to attend the USC dentistry school to learn the profession. Soon after her graduation she became the first licensed female African American dentist in the state of California. Dr. John Somerville was spared of the draft, thus allowing the two to practice together. They shared patients until Vada Somerville retired in 1933. The Somervilles were community activists. They started the Los Angeles branch of the National Association for the Advancement of Colored People (NAACP) in their home in 1914, with John Somerville as the chapter’s first president. Vada Somerville’s retirement in 1933 allowed her to thoroughly invest her time and leadership in civic involvement organizations, including the Los Angeles League of Women’s Voters, the Council on Public Affairs, UCLA’s YWCA, and the USC Half Century Club. In each organization she encouraged young women to pursue careers in dentistry. During the 1920s Los Angeles attracted more African Americans than any other city on the West Coast. In response, Vada and John Somerville built the Hotel Somerville to accommodate African American guests who visited the city. Only weeks after its opening, the hotel hosted the NAACP’s National Convention in 1928. Among the guests at the hotel were civil rights activists such as W.E.B. DuBois and soon-to-be Congressman Oscar De Priest of Chicago. John Somerville also established the LaVada apartments, named after his wife. It was the first modern apartment building constructed in Los Angeles city specifically to house black tenants. On October 16, 1972 the couple celebrated their 60th wedding anniversary. Dr. Vada Somerville died seventeen days afterward, at age 87. The Incredible Life of John Alexander Somerville, http://www.sarahlifton.com/pdf/feature_articles/USC_Somerville_article.pdf; "John & Vada Somerville." USC Center for Black Cultural and Student Affairs (CBCSA), http://www.usc.edu/student-affairs/black_cultural_center/helpful_links_somerville.shtml; Clifton O. Drummet, "A Historical Perspective of Thirteen Unheralded Contributors to Medicodental Progress." Journal of the National Medical Association 81:3 (1981); Rick Moss, "Not Quite Paradise: The Development of the African American Community in Los Angeles through 1950," California History 75.3 (1996); Kenneth Marcus, "Living the Los Angeles Renaissance: A Tale of Two Black Composers," The Journal of African American History 91.1 (2006).